Brackenrigg is located in the Naddle valley 2.5miles from Keswick and 10 mins drive from Grasmere with magnificent views of Helvellyn and Blencathra, gardens, ball play paddock, and woodland to explore, home to red squirrels, deer, badgers, buzzards and owls, and delightful walking straight from your door, including the ancient stone circle at Castlerigg & Thirlmere lake about 1.5 miles away. Beautiful holiday cottages for 2, 4, and 10. The location is superb for exploring all areas of the national park, well positioned in the very heart of the Lake District. Whether you're looking for a cosy retreat for 2 or a family holiday, one of our lovely cottages will provide you with a great venue. The Sett: Spacious 2 bedroom (1 double, 1 twin, plus z-bed for a child) delightful barn conversion sleeping up to 4-5; featuring full height windows, beams and open stonework. Comfortable large open plan living/dining/kitchen area. Two large sofas, TV/DVD/ipod doc/free wifi. Dining for 6, separate kitchen area with ceramic/oven/microwave/dishwasher/fridge with freezer compartmen. Family bathroom with shower over the bath. Centrally heated throughout. Outside BBQ & patio furniture. Sorry, The Sett cannot accept dogs. Brocklebeck & Bleaberry: Cosy, comfortable cottages for up to 2 in our converted barn,(1 double, 1 twin - can be made up as a double) retaining much of the orignal features. Ground floor bedrooms, lounge/dining area. All open plan. Well equipped kitchen with ceramic hob/oven/microwave, fridge with freezer compartment & use of separate freezer. Well appointed bathroom with shower over the bath. Dining area for two. Lounge area with comfortable sofa & chair TV/DVD/Ipod doc/free wifi. Bleaberry cottage welcomes your small well behaved dog. Brocklebeck is unable to accept dogs. Barn laundry room for use by all 3 cottages with washing machine, drier, and boot room. This gorgeous spacious Contry House with views extending to Helvellyn to the East & Blencathra & Skiddaw to the North makes a great venue for your family, friends or group holiday. Tastefully decorated in greys, blues and creams. Double aspect lounge with bay windows, wood burning stove opening onto large Kitchen/Dining room with hand made oak kitchen, electric 4 oven range cooker, butler sink, microwave, large fridge/freezer dishwashe. Spacious laundry/boot room with large commercial washing machine and tumble drier. Butler sink for cleaning muddy boots! Games room with air hockey table, lots of board games and books. Upstairs 5 generous Bedrooms, all with ensuite shower rooms. 3 double, 2 twin. Master suite with jacuzzi bath as well as separate deludge shower. Two z-beds available suitable for additional children, also a cot & high chair, please order on booking. 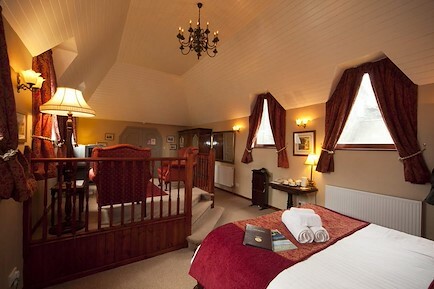 Very comfortable & well-equipped, centrally heated, with wood burning stoves in lounge and games room. There is a 37" flat screen TV/DVD, CD player, Free Wi-Fi, and iPOD doc. A spacious holiday house exploiting the superb views of the Helvellyn range through the large windows. Outside there is a large summer house with seating with BBQ area, & gardens. Perfect for summer evenings, or cooler evenings using the summer house. There is a large verandah overlooking views to Helvellyn across the valley. Particularly suited to groups and families. Brackenrigg House is unable to accept dogs. In the very heart of the Lake District, with superb views of the Helvellyn range, about 2 miles from the delightful market town of Keswick-on-Derwentwater, and a 10 minute drive from Grasmere. The magical ancient stone circle at Castlerigg is about 1.5 miles away, and Thirlmere Lake just a 2 mile walk or cycle. All areas of the National Park are easily accessible from this central location. Your enquiry will be sent directly to Brackenrigg Holiday Cottages. Please fill in as much detail as you can.